Design is a critical element in the manufacturing and construction industries. 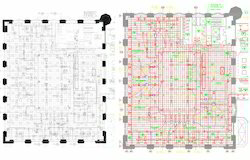 However, it is difficult to maintain the huge amounts of paper-based designs, blueprints and plans, necessitating conversion to CAD based digital formats. This not only helps to create a soft-archive of designs but also saves investment in resources that are required to operate and maintain conventional paper based designs. A highly trained Engineering services team in our company backed by a strong process will help you turn around your design requirements as per your specifications and business needs.